• Before heading out on vacation, be sure all office lights and electronics are off and pull your blinds closed to keep out the mid-day sun. • Try a commute option besides a single-occupancy vehicle this summer or speak to your supervisor about telecommuting. • Visit Emory’s Farmers Market on July 21 and Aug. 25 for the Heirloom Tomato Festival. • Make a personal sustainability pledge. • Subscribe to Emory’s sustainability weekly newsletter and follow on Facebook and Twitter. • Remember to recycle — even chip bags and granola wrappers can go in plastics recycling. • Try capturing and reusing water at home for your lawn and garden; Emory’s WaterHub is capable of recycling nearly 40 percent of the water used at Emory. 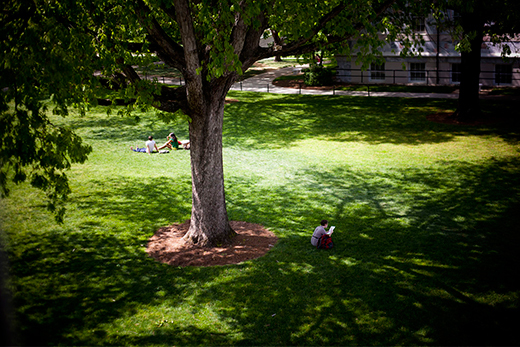 Emory ranks among the top 10 "greenest universities" in the country for 2015, according to BestColleges.com. Emory placed eighth on a list of the top 39 schools, drawn from evaluations of more than 200 colleges and universities. "Our goal with this list is to spotlight the schools that have launched the most impactful initiatives to reduce on-campus waste and energy consumption, promote alternative transportation, provide funding to student and faculty-led green proposals, and take other measures to benefit the environment," the website notes. BestColleges.com based its list of greenest universities on results from a tracking, rating and assessment system created by the Association for the Advancement of Sustainability in Higher Education. Categories considered in the ratings include academic curriculum and research; campus and community engagement; operations; and planning and administration. "We are honored and delighted that Emory has been ranked the 8th 'greenest university' in the country," says Ciannat Howett, Emory's director of sustainability initiatives, adding that the ranking "validates the hard work of a large network of faculty, staff and students — most volunteering their time — who have helped create a more sustainable campus and community over the past decade." "It is a source of pride to everyone at Emory that sustainability is held as a fundamental principle of the university," Howett says. "It feels good to work for an institution that walks the talk of ethical behavior and positive transformation in the world." Explaining Emory's No. 8 ranking, BestColleges.com lists a variety of factors, from the university's 700 acres of green space and construction of LEED-certified buildings to "robust offerings in the way of academics in the study of environmental science." "I'm particularly pleased that our efforts to incorporate sustainability into Emory's academic mission were recognized," Howett says. "By preparing our students to be leaders of a more sustainable future, Emory's commitment to sustainability extends beyond our campus gates, across generations and around the world." Emory's long-held commitment to sustainability marked a significant milestone in late 2014, when the university met — ahead of schedule — its 10-year goal to reduce energy use by 25 percent per square foot by 2015 from 2005 levels. Emory also recently celebrated the grand opening of the WaterHub, an innovative ecological water re-use system that will provide nearly 40 percent of the campus' overall water demand. The first and only WaterHub in the country, the facility uses plants and colonies of microorganisms to recycle up to 400,000 gallons per day. "Emory's sustainability initiatives is celebrating a decade of positive change at the end of 2015, and we will be inviting our campus community to engage in framing a new vision for the next decade to launch in 2016," Howett says. Sustainability Initiatives will circulate a "community conversation kit" during the fall semester to seek input on a new Sustainability Vision to span 2016-2026. "Our goals will include Emory's current commitment through the Atlanta Better Buildings Challenge to reduce energy and water use by 20 percent by 2020 from 2009 levels and to reduce our carbon emissions by 20 percent (35 percent per square foot) by 2020 from 2005 levels," she notes. In 2014, Emory was recognized among the top performers in the Atlanta Better Buildings Challenge. More than 6.5 million square feet of Emory University and Emory Healthcare buildings are included in the challenge, making Emory the largest ABBC participant.